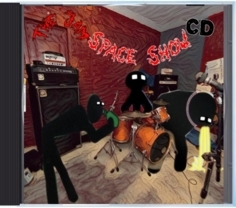 New York City (15 February 2017) - Hosted by the Seattle rock band Fluffer,, a new compilation titled “The Jam Space CD” (out NOW on CD and digitally from Factory Fast MixCDs) features nearly 60 minutes of molten music and jocular joy. Release Notes - Serried highlight clips from the past nine episodes of The Jam Space podcast in sync with eight new tracks of fused Rock tears off and makes for a really unique release. Fluffer spoofs everything from their “Secret Love Package” to hosting their Ghost Hunter friends who shake the Jam Space down looking for any evidence of “Spiritual Orgies”. It is probably more fun than you should have on 4.72 inches of polycarbonate plastic. This unique release is supported by The 365 Radio Network, Cator Web Radio, Code Zero Radio, ISX Radio, NGFY, Ceejay Radio, Q108 Kingston, Only Rock Radio, Open The Door Radio, It Matters Radio, The Indie Radio Network, CONTROLRadioUK, The Dog and Crow Show, The Quinn Spinn Show, Dr. Bones NMS Show, Radio Wigwam and other great internet stations.